Make this a fun and learning summer! Our summer camp operates from 7:30 am - 6:15 pm Monday - Friday with 2 Field Trips every week. One trip to go swimming and something different every Friday! We Bowl, Roller Skate, jump around at Monkey Joe's, game at the Power Arcade, and see First Run New Movies. When we get rained out for a field trip, we have a bouncy house inside our school and pizza party (not a bad switch of plans!). We also do Arts and Crafts on rainy days, too. 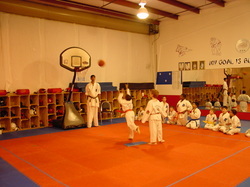 We have two Karate Classes per day during the summer, making our program the best for your child. They will really learn a lot of Martial Arts during the summer as well as have a lot of fun playing here and going outside on field trips. 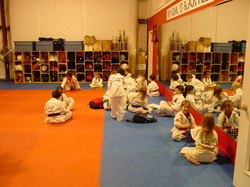 All of our students dress out in their Karate Uniform for all classes. We really put the emphasis on Discipline, Structure and Tradition. There are times to play, eat and learn just like at their regular school. You will be able to roll over into our convenient After School Program with Transportation provided from your school or go into our traditional Karate Evening Classes at 6:00pm at the end of summer. Our building is 7,000 sq ft and is air-conditioned to be comfortable in the summer. Our building was specifically built for our program and we incorporated a ceramic coating on our roof for coolness in the summer. We have special rubber flooring for safety throughout with the main floor divided into four separate rooms. This compartmentalization enables us to teach multiple classes with multiple teachers and keep the focus of the students. We have Basketball in one room, Dodge Ball in another, Four Square in another and in the fourth room is a Quiet Room where the children socialize and play board games of every description. We have a separate air-conditioned viewing area to come in and watch your child at any time. We have wireless internet access in the viewing area and this area doubles as a snack and lunch area. Your child will need to pack a lunch every day during the summer as we do not prepare meals. We have a TV and will also watch DVD movies between Games, Arts & Crafts, Meals, Classes and Field Trips; Their days will be full of activities!